As people continue to struggle with unaffordable health insurance, the traditional insurance plan is often being swept aside in lieu of the more flexible and less expensive healthshare program. Considered more individualized than other plans, health sharing programs have become the more logical choice for many who don’t qualify for health insurance subsidies and are needing a more affordable alternative. Though not technically insurance, health sharing organizations have been around for several decades, and well over a million Americans are already members. Similar to a health insurance premium, health sharing programs have what they typically call a monthly contribution, which is often less than half of what a person’s health insurance premium would be. Dozens of healthshare programs exist, with Altrua, Aliera, Medi-Share, Kingdom, Mpowering, Liberty and Samaritan being the most popular. 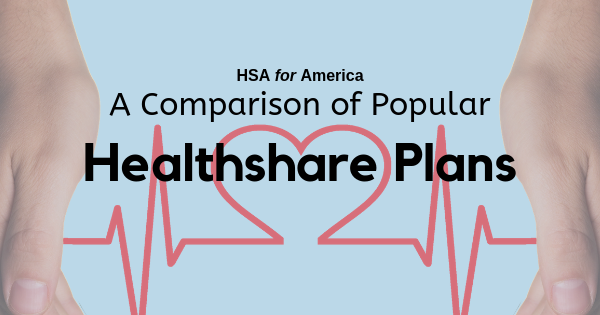 See how these seven popular healthshare choices compare and where you can sign-up for whichever one best fits your lifestyle. These seven healthshare programs are more popular than other healthshares, with each one having various requirements for membership. Some providers even have a unique method of sharing bills across their network so you will always know who you are helping. The plan that best fits your needs will, of course, depend on the price and benefits; it may also depend on your willingness to sign a statement of faith with some organizations and whether you want an HSA-qualified plan. If you would like to sign up for or learn more about any healthshare plan, our personal benefits managers are standing by during regular business hours. Call today for a healthier you!